The Chelsea Corner Summer House is a unique and modern design that will make a stunning addition to your garden. Neatly tucked away in a corner, this 7x7ft summer house could be used for multiple activities ranging from a dining area to an art studio. 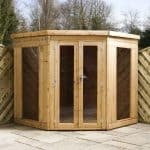 This unique summerhouse is capable of being placed in most parts of the garden. It’s shape allows for integration in awkward spaces, and spaces that are smaller than others. 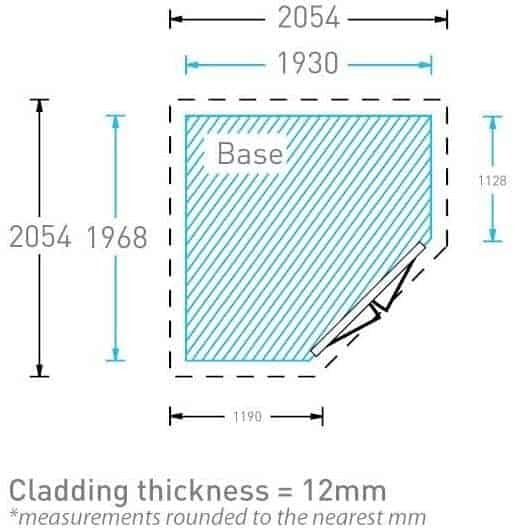 There is a solid sheet board on the floor that adds to the overall stability of the building, and tongue and groove cladding that helps with wear and tear. A Pent roof keeps the water out, while two extra windows add more light than you would expect for this size of building. All in all, plenty to like about this unit. The unique design takes advantage of a spare corner in your garden to create extra living space for you and your family and friends to enjoy whatever the weather. If you desire extra living space or simply a covered area in your garden that allows you to enjoy the garden whatever the weather, then the Chelsea Corner Summer House could be the right product for you. 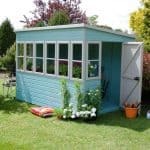 You might also like to see the top 20 corner summer house currently on sale in the UK by visiting the WhatShed corner summer house awards league table. 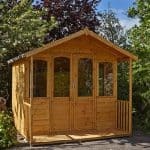 When looking for the perfect summer house for your garden you may have many criteria that you wish to fulfil, from style to size and price. In this section we look at the Chelsea Corner Summer House in more detail and discuss all the features and qualities, good and bad, that it displays. In doing so, we hope that we can help you make a more informed purchase decision in your search for a summer house. Exterior: The summer house is constructed from 12mm tongue and groove timber cladding that gives the shed a traditional feel in an otherwise modern design. The timber is very natural looking in its raw state and would blend effortlessly into the surroundings of your garden. Interior: The summer house interior measures at 7x7ft, giving a nice size for a table and chairs, a seating area or a few hobby items. 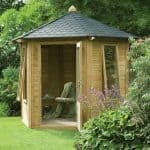 Whilst due to mainly the corner fitting shape of the summerhouse it isn’t that accommodating to larger items, it does work well as an occasional use building. Windows & Doors: The windows and doors are certainly a feature of the summer house, with floor to ceiling glass to make the most of the views of the garden. The double doors are a nice size to be left open during the summer and will allow for easy accessibility. Security: The summer house comes complete with a lever sash lock which will keep the doors firmly shut and the interior contents secure whilst not in use. 7 x 7 Chelsea Corner Summer House: How easy to build? 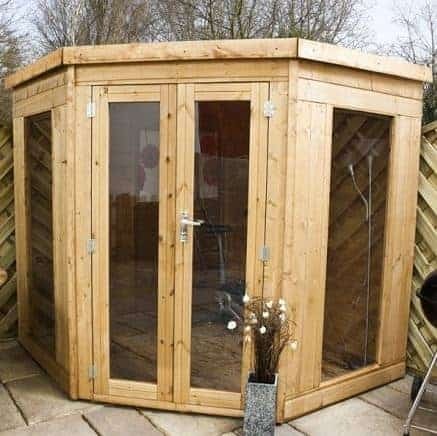 It is recommended that the Chelsea Corner Summer House be assembled by two people for safety reasons due to the size and weight of the timber and glass parts. The summer house will be delivered directly to your door in a flat-packed package, ready to be assembled. 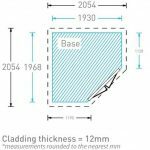 The package will contain all of the timber panels, glazing, roof materials, fixtures and fittings that you will require. A complete instruction manual will be included with step by step instructions and easy-to-follow diagrams. We expect that this summer house could be assembled within a day by those with a basic knowledge of DIY. 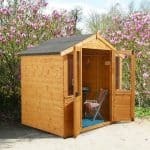 7 x 7 Chelsea Corner Summer House: What is the overall quality like? The Chelsea Corner Summer House certainly looks the part but is it as good quality as it looks? The timber cladding uses 12mm tongue and groove boards to give the structure a traditional appearance and sturdy feel. All of the timber used is FSC certified and carries a 10-year rot guarantee. 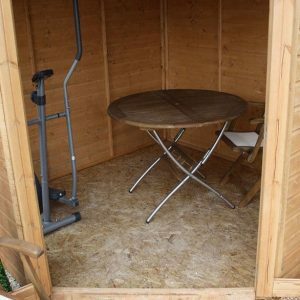 The floor and roof are both constructed from solid sheet board as well as green felt material for the roof to protect against the elements as well as damp, rot and mould. The ability for you to select a free colour treatment for your summer house means that you can personalise your summer house to your specific requirements, whether to match existing items or to create a feature building. 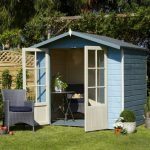 The Chelsea Corner Summer House is a stylish summer house that will be the perfect fit for an empty corner in your garden. With floor to ceiling glass windows and doors along the entire front of the building you can enjoy uninterrupted views out into the garden. 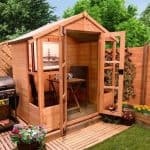 With flexible use, from a relaxation area to a hobby space, the Chelsea corner summer house would suit many needs.